The 27th Annual Texas High Performance Racing Auction, Trade Show & Swap Meet takes place on Saturday, December 15, and will once again offers racers everything from dirt track and drag race cars, tracks and sanctioning organizations to go-karts, trailers, engines, tow rigs, new and used parts, tools, shop equipment and more. Produced by 4 Speed Promotions, the event happens inside the J.S. Bridwell Agricultural Center at the Multi-Purpose Events Center (MPEC) located at 111 N Burnett St. in Wichita Falls, Texas. Hundreds of items will be auctioned every hour throughout the auction. The auction doors and trade show will open at 8 a.m. each morning. Set-up time for consignments and vendors is Friday, December 14, from 10 a.m. until 6 p.m. The trade show area is for any business or individual selling or promoting their product to the public, and there are deep discounts for those who exhibit at two or more of our four shows. There are 15 booth sizes available, and each booth includes a professionally draped booth and table, two folding chairs and two exhibitor passes (additional passes may be purchased at a discounted rate). Electricity is included on a first-come, first-served basis. Exhibitors can register online at RaceShow.net or call (940) 733-8937 to reserve your space. You must register ahead of time to reserve your space. You will only be charged a $50 deposit when booking your show(s) online. Exhibitors may send a check or call to pay by credit card, or you can simply pay the balance at the show when you arrive. As a service to local and regional racing organizations, any race track, series or sanctioning body is invited to take advantage of a free booth offered by the Texas High Performance Racing Auction, Trade Show & Swap Meet. • The 22nd Annual Oklahoma High Performance Racing Auction, Trade Show & Swap Meet takes place on Saturday, December 29, inside the Centennial Building at the Oklahoma State Fairgrounds in Oklahoma City. 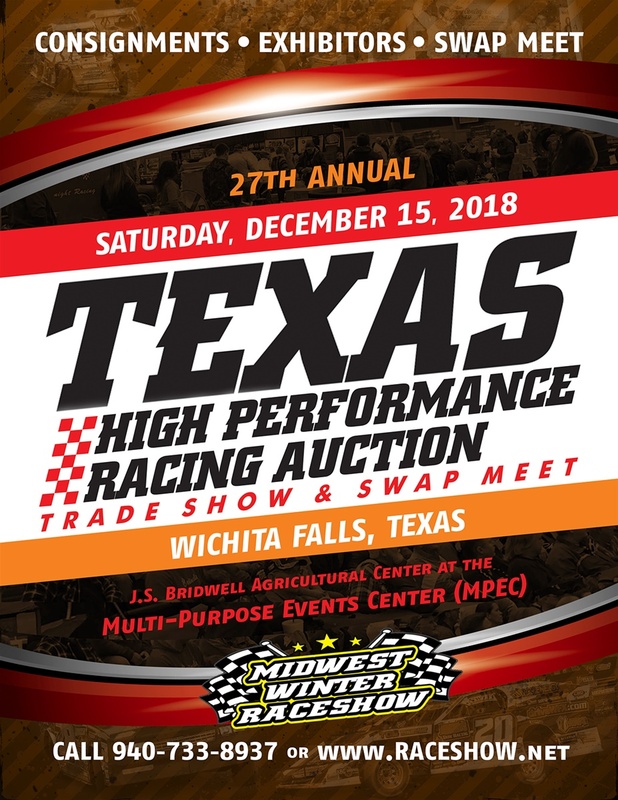 • The 32nd Annual Kansas High Performance Racing Auction, Trade Show & Swap Meet takes place on Saturday, January 12, 2019, at the Century II Convention Center in Wichita, Kansas. • The 22nd Annual Tulsa High Performance Racing Auction, Trade Show & Swap Meet takes place on Saturday, January 19, 2019, inside the Exchange Center at the Expo Square in Tulsa, Oklahoma. For more information or to register for one or more of this year’s blockbuster events, call (940) 733-8937 or visit RaceShow.net online.